Why the Herman Cain boomlet may actually last. 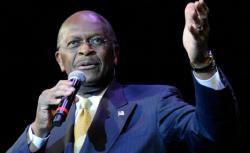 Does Herman Cain have a shot at the GOP presidential nomination? Photograph by Ethan Miller/Getty Images. The candidate was a former lobbyist. He supported TARP. He suggested abortion was a personal choice, which won him the dreaded flip-flopper label. At one point or another just one of these qualities or positions has been declared a fatal vulnerability for Republican candidates, from Haley Barbour to Mitt Romney. Herman Cain has all of them. Cain is no longer flavor of the week—he’s a regular menu item. He’s popular, we know that. And now, after several weeks of attacks, gaffes, and scrutiny, he has shown endurance. Based on the collapse of the Michele Bachmann and Rick Perry campaigns, you might expect Cain’s various rough moments would cause a drop in the polls. They haven’t. If anything, he’s increased in popularity, which shows just how suspicious voters are of the political class and how much they’re willing to put up with someone who isn’t a member of it. Cain leads in both the national polls and state measurements. A CBS News poll found 25 percent of Republican voters nationwide preferred him to the 21 percent for Romney. In Ohio, the Quinnipiac poll found Cain leading Romney 28 percent to 23 percent among GOP voters. CNN polls show Cain tied with Romney in Iowa and South Carolina and trailing him in Florida. The Gallup poll shows that—unlike Perry, whose appeal soured the more voters got to know him—Cain’s approval rating and intensity score among Republicans has gone up along with his name identification. What allows Cain to sustain? (Besides easy rhymes?) He’s not from Washington. It comes up time and again in conversations with his supporters. Polls show his strength is with Tea Party voters who are the most anti-Washington in the electorate. His “outsider” status—unharmed by stints as a chairman of the Kansas City Federal Reserve or as head of the national restaurant lobby—is also shielding him from criticism. Anyone who attacks his 9-9-9 plan is part of the permanent political class—the people who got us into this mess—trying to protect their advantage. Not being a politician also gives Cain a big gaffe cushion. His “joke” about an electrified border fence, his flirtation with trading hostages for Guantanamo Bay detainees, and his momentary moderation over whether abortion is a choice do not seem to have hurt him yet. Instead, they’re seen as proof that he’s not a polished pro like Romney. When Romney and Perry go after each other, Cain benefits by not being a bickering politician. Perhaps the thickest part of the cushion for Cain is that his conservative voters don’t have anywhere else to go. Michele Bachmann was eclipsed by Perry. That isn’t going to happen to Cain. There aren’t any eclipsing figures left. Gingrich is having a slight burble of resurgence but he’s unlikely to become the new flavor; one of the qualities of being a flavor of the month is that people don’t know much about you. Gingrich, for better or worse, is the best known of the bunch. Perry has a long uphill slog to regain what Cain took from him, which will be hard to do in part because Cain is more appealing to voters. Tea Party support may be keeping Cain aloft, but to grow and actually pose a threat to Mitt Romney he’s going to have to find a way to appeal to more moderate GOP voters. The really exciting thing about the Cain campaign is that while on the one hand he is defying gravity, the candidate and his staff are constantly ordering in more anvils. Cain is running to replace a president who was criticized for having no experience, but Cain himself practically brags about how little knowledge he has with the issues of the day, saying he’ll rely on advisers and smart people. As the clock ticks toward the start of the voting season Cain will spend this Friday and Saturday in the electorally meaningless Alabama. In keeping with the “The More Unconventional the Better” theme, the campaign put out a video of the campaign chief of staff Mark Block making a pitch for Cain while enjoying a cigarette and blowing the smoke into the camera. It was like nothing anyone had ever seen before. Sort of like the Cain campaign.